·	A wide base, so the chair can't tip. ·	A post that goes between the child's legs to prevent her from slipping between the seat and tray. ·	A five-point harness system that consists of a waist belt, a belt that fits between your child's legs, and shoulder straps. 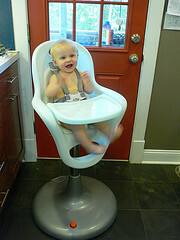 Use a high chair's safety restraints, even in a reclining position. They are there to keep your baby safe. You can’t depend on the tray alone to do the job because it doesn't prevent your child from standing up and possibly falling out of the chair. According to the latest Consumer Product Safety Commission figures, more than 7,000 children suffered injuries related to high chairs in 2005. Deaths also can occur. Most of the injuries resulted from falls when restraining straps weren't used and/or parents turned their backs. The restraints aren't failsafe, and they can provide a false sense of security, which is why your child should always be in view when he's in a high chair. A child can stand in the chair and topple it. He can also slip under the tray and strangle when his head becomes trapped between the tray and the chair seat. ·	On chairs that fold, be sure the locking device is engaged each time you set up the chair. ·	Don't let older children hang onto a chair or its tray, play around it, or climb into it, especially when your baby is in it. The chair could tip over. ·	If your chair's seat is adjustable, don't raise or lower the seat height with your child in the chair. ·	If your high chair seat reclines, don't adjust it while your child is seated in the chair. ·	Don't use the seat's recline feature for infants who weigh more than the maximum (usually 20 pounds). ·	Don't lift or move a high chair with your child in it. ·	Keep the chair away from a table, counter, wall, or other surface from which your child could push off with feet or hands. That can lead to tipping. ·	Inspect the chair often. After your baby has been using the chair for a while, check to make sure it's still in good shape. You'll want to be sure the seat belt buckles and the wheel locks are secure, the chair and its reclining mechanism still lock into place, and any small parts remain firmly attached. Restaurant high chairs are notorious for having broken safety restraints and other defects. Instead of relying on the restaurant, bring your own portable hook-on chair like the Graco Travel Lite Table Chair or feed your child in their stroller. Copyright 2015 Baby-Safety-Resources.com. All Rights Reserved. No reproduction without permission. 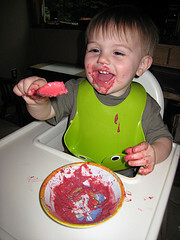 ALL content on Baby-Safety-Resources.com is for informational purposes only. If you have any concerns or issues, please seek the advice of your healthcare provider.